У меня могут быть какие угодно цитаты из кого угодно. Я за это извиняться не буду. Я использую те слова, которыми я пользуюсь в жизни. Я не собираюсь согласовывать свою песню с комитетом по охране авторских прав, потому что я не признаю авторских прав. И все мои песни могут любыми людьми расхищаться, как им это нравится, потому что мы все звенья одной цепи. Те, кто знают, как пишутся песни, знают, что это естественный процесс. У всей музыки – один источник. Никто ни у кого не собирается красть. Т.е. есть люди, которые специально берут и крадут, потому что им нужно заработать денег. Мы пишем песни не ради денег. Поэтому, когда я пишу, я использую тот материал, который мне доступен. I can have any quotations from anyone. I'm not going to apologize for that. I use the same words that I use in everyday life. I'm not going to run my song by some Committee on Authors' Rights, because I don't recognize authors' rights. And all my songs can be freely looted by anyone in any way they like, because we're all links of the same chain. All music has the same single source. Nobody can steal anything from anyone. Of course, there are people who intentionally steal because they need to make some money. We don't write songs for money. So when I write, I use the material that is in front of me. Boris Grebenschikov (Борис Гребенщиков) is a quintessential founding figure in Russian rock of the late soviet and post-soviet period. Together with his band, Aquarium (Akvarium, Аквариум), he pioneered the pay-what-you-can approach to music distribution on Kroogi.ru with his recent albums White Horse (Лошадь Белая) and Our Life From The Trees' Point of View (Наша жизнь с точки зрения деревьев). Earlier this year, I filed an issue with RIM's issue tracker, TOOL-118, detailing my experience of trying to connect to Blackberry JDWP tool with IntelliJ IDEA. JDWP tool is the proxy to the simulator or actual mobile device that implements the Java Debug Wire Protocol on the outside, allowing an arbitrary JDWP-compatible debug tool to connect for a remote debug session. 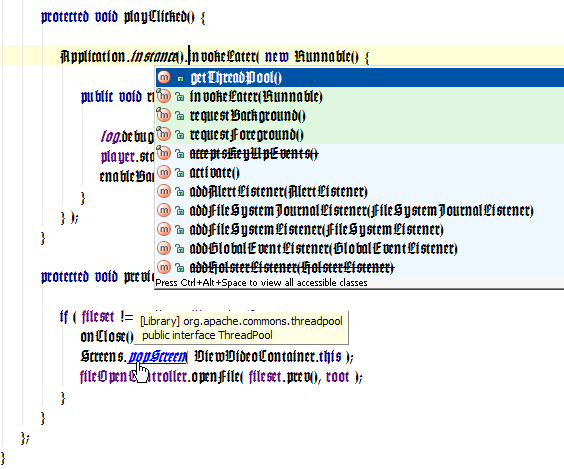 IntelliJ IDEA is the best damn Java IDE in the world, period. The problem was basically that RIM's JDWP tool apparently wasn't fully compliant to the actual JDWP protocol, choosing instead to focus narrowly on its compatibility with Eclipse's debugging implementation. After some screwing around, it seems that RIM's JDWP tool expects something along the lines of jdb's "resume" command after the connection is established, otherwise it just keeps the simulator/device's JVM in a suspended state indefinitely. Well, they promised to look at it, and this morning, roughly half a year later, their work was complete. JDWP with other development environments is no longer officially supported. Only the use of JDWP with the Eclipse plugin is currently supported. Because, you know, "we want to meet you on your turf, we want to make it easy for you to use the tools you're already using". Thank you RIM, I love you too. Someone make a monospaced Faktur please... I would use it!